This conversation takes place with two ethnographers of Los Angeles: Juli Grigsby is an assistant professor of anthropology at Haverford College, who researches Black women’s political subjectivity, violence, and reproductive justice; and Damien Sojoyner is an associate professor of anthropology at the University of California at Irvine. In this short piece, we discuss the impact of gentrification and its insidious process removing of Black communities through the building of rail infrastructure. DS: The migration of Black people to Los Angeles from the South was in part a family affair. However, I wonder what happens to families when people are forced out of their homes and communities. How does that affect the telling of those histories of migration and constructions of home? JG: I think this is a very important question. To begin, people generally associate migrant displacement with people moving great distances or becoming displaced from inadequate infrastructure that has failed to withstand a catastrophic natural disaster. In the case of Black LA, we are actually seeing micro-displacement and micro-migration due to gentrification—meaning families and community members are not leaving the city entirely. Instead, similar to historical Los Angeles patterns of redlining and segregation people are being pushed from street to street, in close proximity to extended family, community spaces, or former employers. Many are setting up temporary housing in neighboring pay-by-day parking lots. Comparable cases might be the condensing of space in downtown LA’s Skid row or the forced removal of 1,200 people from the Santa Ana Riverbed. In all cases, there are families displaced together creating temporary homes built on established networks. A much more nuanced conversation of gentrification is imperative to ethnographic research. 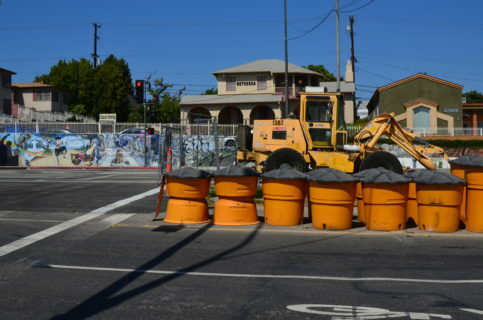 Rather than reconceptualizing constructions of home it may be more productive to rethink gentrification as a practice of capitalist surveillance and to intertwine the social history of Leimert Park with other spatially raced areas of Los Angeles experiencing similar policing, displacement, and economic decline. For example, on one hand, you see a lot of social media regarding the construction of the LA Rams NFL arena from Uplift Inglewood (@upliftinglewood). Community organizers are looking to sue the city for failing to create affordable housing by instead selling land to build a stadium. On the other, we see the use of social media to highlight the damage of gentrification surveillance while showcasing the community support for street vendors and rent strikes through Fight for MacArthur Park (@fight4macarthurpark). While there is an abundance of such stories online, if they are not put in conversation with stories of where people are migrating to then it seems as though removal is inescapable. So to answer your question, in telling these stories, it is as important to consider the modes of gentrification as well as the outcome—the making of homelessness. JG: You were born and raised in Los Angeles. Can you tell me what makes the process of gentrification occurring in Leimert Park and South Central Black Los Angeles unique compared to other iterations you’ve witnessed in the city? DS: The term gentrification is a far-too neutral descriptor that is used by developers, progressive organizers, and city officials alike, but it conveys a different meaning depending on the constitutive group. In the case of South Central Los Angeles, I think we should call it what it is—Black removal or forced Black relocation. This current iteration is the extension of an urban planning model that was implemented during the late 1990s and early 2000s. Anchored by a massive expenditure of public funds into non-public controlled spaces such as sports arenas, this same type of development occurred in downtown Los Angeles with the Staples Center. However what separates this iteration from the previous is the spatial scope and breadth of impact. Aside from Chicago, I cannot readily think of a city in the United States where a model of Black removal has been enacted upon such a large geographic space. Second, it is unbelievable to think that within roughly seven years, there will be three sports stadiums and a rail system built in the heart of Black Los Angeles. Just think about the number of families and communal institutions that are being disrupted. The scope of the project is simply astounding and honestly maddening. JG: In what ways do you think the increased support of public transportation infrastructure impacted the Leimert Park/Crenshaw Community? Specifically, which city or county policies expedited these processes? DS: The key here is the connection between policies funded at the federal level and their implementation at the state and local level. When city governments obtain federal dollars for development of Black communities, very often in response to Black demands for public investment, those funds are contingent upon the build-up of the public transportation sector through policy initiatives such as Promise Zones. This is where things get very tricky because Los Angeles’s economy and social and political hierarchies are largely fueled by real estate, and real estate and public transportation are intimately connected via structural processes of land value and race. In LA, this amalgamation has always worked against Black communities. Very crudely, the rail system plan is executed for a Black neighborhood, financial incentives through policy formations are provided to “develop” those areas, developers begin “flipping” commercial and residential areas, rents and mortgages explode, policing dramatically increases to protect the developers financial interests/investment(s), Black people are forced out either to jail and/or prison or in search of affordable housing, which often takes the form of an automobile or subsidized housing out of the area that is in excess of over 70 miles away or out of the state all together. DS: In thinking about Black Los Angeles and Leimert Park in particular, I cannot help but think of the role that art has played in its development as a site of Black joy and being. From music to murals, can you discuss how removal schemes have come to alter Black cultural formations in the area? JG: To understand the importance of the Leimert Park neighborhood and community to Black Los Angelinos, we really need to go a few decades back. Leimert Park is situated off Martin Luther King Blvd and the famed Crenshaw Blvd. It is located at the nexus of Black life in South Central, with upper-middle-class Black neighborhoods of View Park and Baldwin Hills to the west and the working-class neighborhoods of the Vermont Harbor area to the east. In the 1990’s, the rise of Black cultural spaces consolidated in Leimert Park. It was home to the Good Life Café, an organic health food café, that hosted community lectures, health workshops, and eventually became a popular underground hip-hop venue. Also, in the 1990’s The Vision Theater, a 1930 architectural art deco icon, was purchased by actress Marla Gibbs, who rose to prominence through her comedic role on TV Sitcom The Jeffersons. The theater under Gibbs’ ownership became a performing arts center that supported local community organizations. In fact, The World Stage, which opened in 1989 as an education and performance space, continues to host prominent Jazz musicians and maintain its presence despite increasing rents and venue relocation. 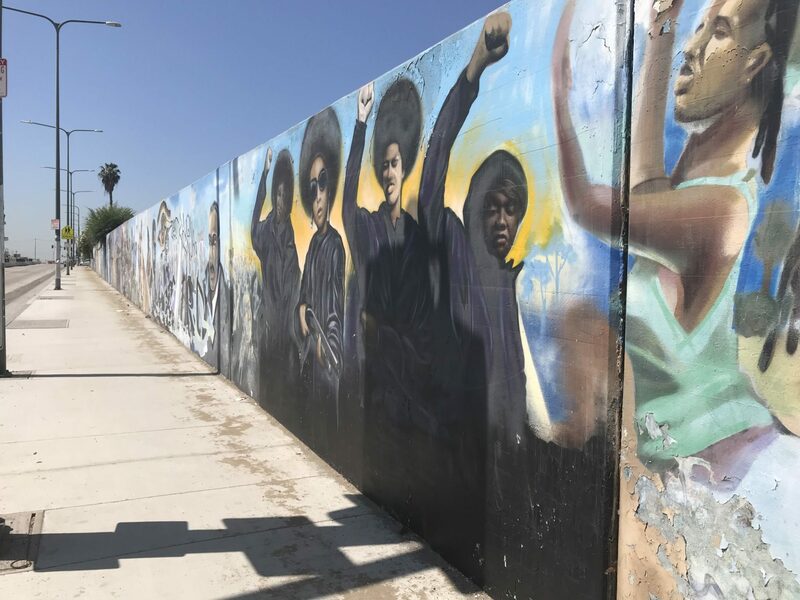 The centrality of Leimert Park isn’t merely marked by the surrounding neighborhoods but is noticeable by the intentional public use of Black Art iconography throughout the surrounding plaza as well as the confluence of poets, visual art, music, and support of community organizations. 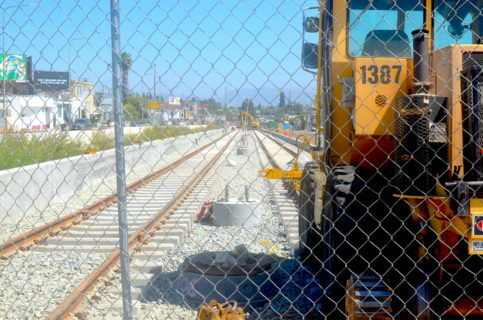 Black removal in Leimert Park was facilitated by the 2009 decision to construct an above-ground train route. This route will connect commuters from downtown via the Exposition Line and travel the length of Crenshaw Blvd through the city of Inglewood (near construction of an NFL Stadium) to eventually end at LAX Airport. Originally contested by community organizations citing safety concerns and financial loss for businesses, the most visible consequences are the ways construction barriers have fragmented cultural spaces. The use of fencing, policing, and road closures create a silo effect where artists and musicians are funneled to one or two open venues while the majority of the area is off limits. 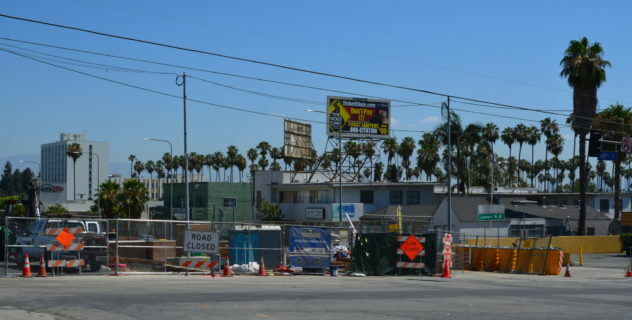 Also, intermittent closures of Crenshaw Blvd and surrounding avenues eliminates street parking which creates a continual flow of traffic that guides people away from the area leaving streets empty. 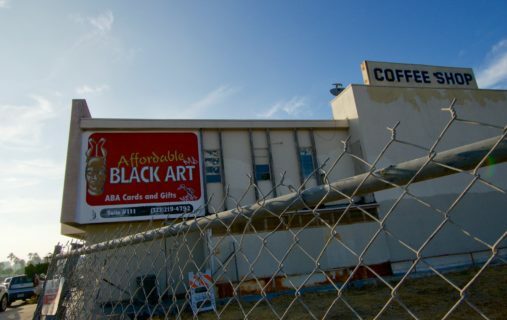 Given that much of Leimert Park’s art is community-based the inability to access the area has displaced numerous artists or forced suspension of book festivals, African art markets, and Sunday drum circles once coordinated with local businesses. Instead of taking place at Leimert Park Plaza, organizers are forced to host events at local malls or museums, which again deters a consistent engagement with community residents. So here you have intergenerational Blackness and communities that are faced with Black removal facilitated by increased real estate construction making the Leimert Park/Crenshaw neighborhood inaccessible to the very people that created the areas’ vibrant legacy. This is why we are suggesting a much more nuanced conversation of gentrification is imperative to ethnographic research. Juli Grigsby is an assistant professor of anthropology at Haverford College, who researches Black women’s political subjectivity, violence, and reproductive justice. Damien Sojoyner is an associate professor of anthropology at the University of California at Irvine and author of First Strike: Educational Enclosures in Black Los Angeles.